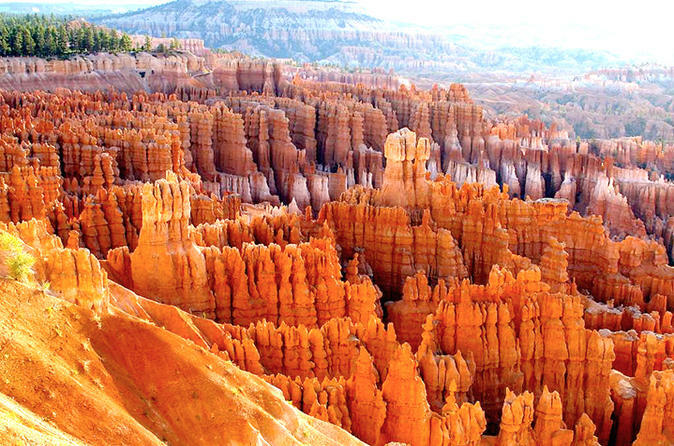 Experience the awesome beauty of Bryce Canyon and Zion National Park on a day trip from Las Vegas. Enjoy complimentary hotel pickup by either a luxury SUV or mini-coach, a boxed lunch and a wonderful day away from the casinos. Named after the Mormon Pioneer Ebenezer Bryce, Bryce Canyon became a National Park in 1924. Bryce is famous for its unique geology, which consists of a series of horseshoe-shaped amphitheaters carved from the eastern edge of the Paunsaugunt Plateau in southern Utah. Erosional force has shaped the colorful limestone rock of the Claron Formation into bizarre shapes, including slot canyons, windows, fins and spires called hoodoos. Tinted with colors too numerous and subtle to name, these whimsically arranged rocks create a wondrous landscape of mazes, offering some of the most exciting and memorable walks and hikes imaginable. Located at the junction of the Colorado Plateau, Great Basin and Mojave Desert provinces in Southwestern Utah, Zion National Park protects 229 square miles (593 square km) of dramatic landscape with sculptured canyons and soaring cliffs. The unique geography and wide variety of life zones within the Park make Zion significant as a place of unusual plant and animal diversity. Discover the natural grandeur of Zion as you admire high plateaus and a maze of narrow, deep, sandstone canyons with striking rock towers. Kolob Arch, the world's largest arch, is just one of many beautiful structures that await you on your adventure. After a full day of exploration, you will be dropped off at your original departure point.